End of the Road. Just wanted once again to say thanks for all the support on this. We didn't manage to get Mark to the African games but we did make him very happy and set him up with enough equipment so he can keep training. There are plans to set-up a local Kisumu/Western Kenya cycling club and to try and resurrect the Tour of Lake Victoria and other local races to provide some opportunities for cyclists. Also Kenyan Riders are trying very hard to get young people into cycling by loaning them bicycles, throwing youth races, providing coaching etc. If you want to support the future of cycling in Kenya, then they're an excellent organisation. Racing, racing... - Sadly, there was lots of wrangling over support for Kenyan Athletes at the All-African games and with the rise of a professional team in Kenya, Mark didn't get to travel to Mozambique. But in more positive news there are finally some more races in Kenya. One on the 17th in Navisha and the Barclays Race in Nairobi at the end of the month. The Barclays race should be good because there are real prizes and will probably avoid the farcical organisation of many other races I've tried to attend. Winning one of these races would really help set Mark up for racing next year. We also found another frame that Mark might be able to set-up as a race bike which would be a little lighter for hilly races. Fingers crossed that the Jensen II will work out. Forward, back... - I'm back from my travels and Mark is back on his bike again after being way-laid by sickness. While I was away Mark was included in the provisional squad list for the 2011 All-Africa Games! This is great news and may potentially lead to some other support for Mark. 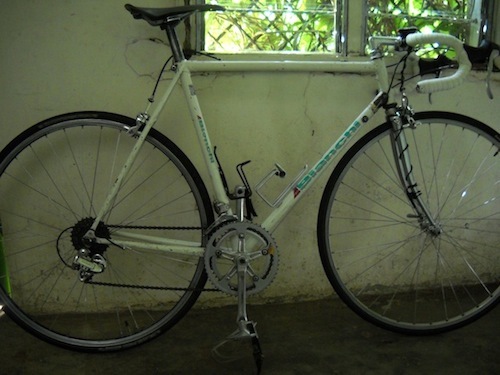 The two big things left to sort are the drivetrain (chainring, rear derailleur and chain) and if we can some decent wheels, or failing that a 36h rear hub and cassette to build some new wheels with (found someone in Nairobi with some decent Rigidia rims that would match). We're still waiting for the next announced race dates to be posted. But in the meantime someone asked about the discolouration on the frame around the downtube/headtube junction. This is because Mark had some homemade cable stops welded on, as we didn't have the small parts to convert the shifter boses to cable stops when the bike got modern shifters. Training, training, training... - Mark is out training as much as possible while waiting for the Kenya Amateur Cycling Association to announce the re-scheduled dates of the next qualifying race. Theres also the Barclay's bank sponsored Step Ahead bike race in Nairobi on the 2nd July which Mark is targeting now. It should be good especially as Kenya's gained another professional cycle team, who should be there to give some stiff competition. Its good to see the sport finally getting some money and attention in Kenya. This is the current state of Mark's race bike ('the Jensen'), which is finally heading in the right direction, though the lack of spares in Kenya is making progress slow. 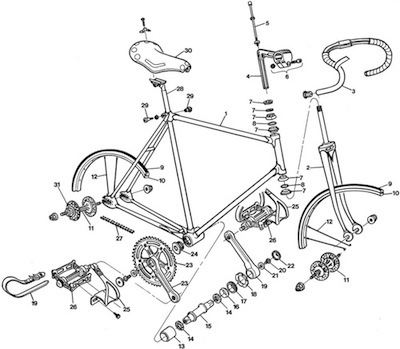 I'm heading to the UK for personal reasons (so I will miss the Nairobi race) but I will be looking out for new handlebars and stem, some new chain-rings (almost impossible to find out here) and a few other bits and bobs to make the bike and Mark run smoothly (pedals, water-bottles etc). Donations are now closed for this project. Thanks for your support. We raised over 300 dollars which has bought a second hand frame, new tires, shifters, handlebars and stem. The rest went go towards race transport, race fees and other parts required to finish the season off. New frame but bad luck continues - While out training Mark's handlebars snapped in half, which put the end to his training rides in preparation for the Nyannuki race; this is the downside to secondhand equipment, you rarely know how abused the parts are. 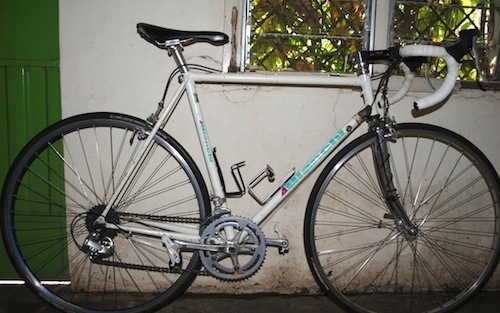 Luckily Mark found an older Bianchi road frame and enough parts to build a race bike in Uganda, which while a little heavier than his old bike, is going to be good enough for this season (and doesn't have bent tubes, cracked fork steerer and damaged stem). Things got a little beat up moving parts via long distance Matatus, resulting in a destroyed front rim and the frame suffered some alignment issues in transit but just on the rear end, which was easy enough to correct. I hope to post photos soon but have been delayed by travel and sickness. Kenya Cycling has also postponed the date of the Eldoret race, which gives Mark a little more time to get used to and prepare for this race on his new frame. Thanks for everyones help on this. I have a working laptop again so am getting in touch with all the kind people that have offered help so far. Currently there are 2x50 USD in cash donations which we will use to fill in any missing parts. Any left over cash will go towards race fees/race support as the season starts. Thanks for all your patience on this.